Want to enhance your smile? At Young Street Dental, our dentists can use bonding treatment to correct your teeth. Why would I get bonding? Most often, bonding is used for cosmetic purposes to improve the appearance of a discolored or chipped tooth. The composite resin used in bonding can be shaped and polished to match the surrounding teeth. How does the bonding procedure work? During the bonding procedure, a resin is applied to the tooth using a high-intensity light. Once the resin is applied, the bonded resin is sculpted to your teeth and polished. This procedure helps to make the teeth look natural. The bonding procedure takes about 30 - 60 minutes per tooth to complete. Protect the tooth root from exposure from a receding gum line. If you are considering getting bonding to correct your smile, talk to our team today! At Young Street Dental, we believe prevention is the key to a healthy smile. We highly recommend an at home routine of brushing twice and flossing once daily to keep a healthy smile between visits. 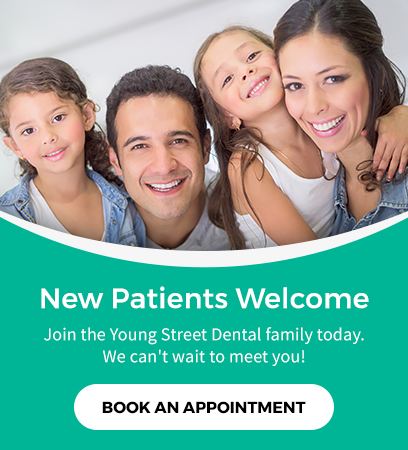 Ready to start your oral health journey with Young Street Dental? Contact us today to schedule your next dentist appointment!